Lately we've been seeing more and more liquid skin protecting products, they're a great invention and Dance Legend also has a version, called Pure Manicure. 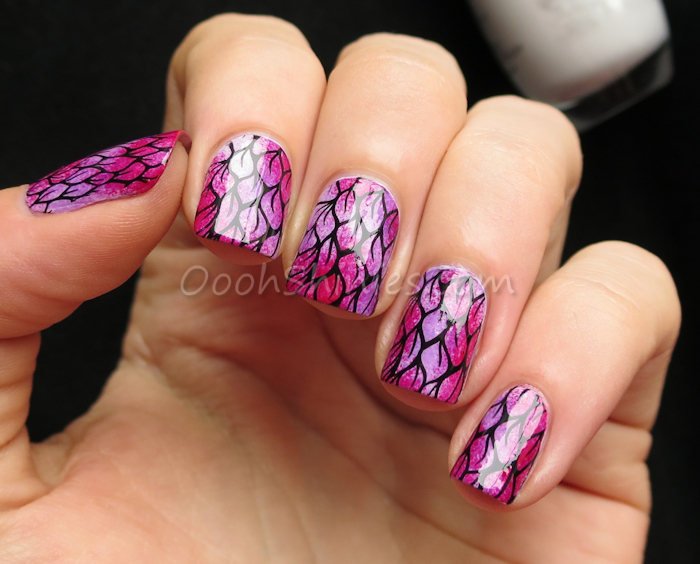 Time to put it to the test, and I did so with a sponged manicure finished with some stamping with a real stainer. I'll tell you straight away that I LOVE this stuff! Pure Manicure is a minty green, thin liquid that comes in a 15ml bottle and applies easily. It's a little runny and it has a small brush to help get a precise application. A little goes a long way! It's quite clear on my image where I applied it a bit thicker than needed, but that doesn't matter at all for the peeling effect. 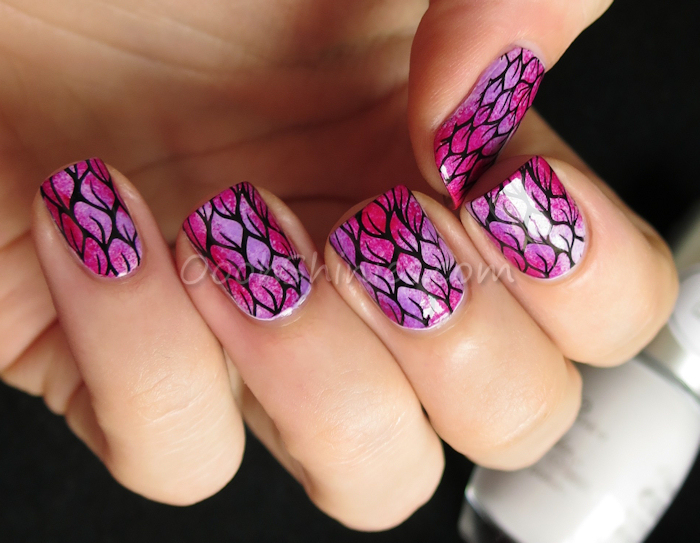 You can apply it just around the cuticles, or if you'd use this for watermarble, you can use it all over your fingers. I also used it below my nails here, it wasn't needed for this manicure but especially when I wrap my tips with polish, it's easy to get a bit on your skin there as well. Pure Manicure dries fast and peels so easily, it comes off in 1 go and I just really enjoy that peeling off! :D On my picture below, you see some tiny bits and pieces of polish on my skin after peeling, but that's all loose and quickly removed with the final cleanup. I have used my peel off basecoat in this way a few times before, but that wasn't really doing it for me. It's stickier, it dries to a clear layer, it's thicker, it doesn't have a handy brush... the real thing just works a lot nicer! 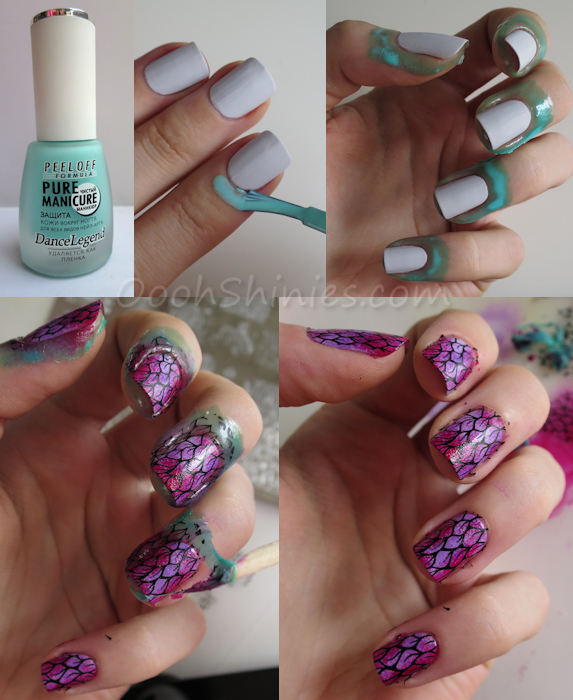 I can definitely recommend Dance Legend's Pure Manciure, it's such a nice tool for all kinds of nail art! You can find it in their webshop where it costs $9 (and various other webshops sell it as well). Essence Enter Wonderland sponged with China Glaze Ruby Deer and Dance Legend Chagall, stamped with Konad Black and UberChic Beauty UC3-02.